What size flag should I fly? We receive this question on a regular basis, the best way to answer the question is usually with more questions. How will the flag will be used? Is the flag for indoor use or outdoor use? Will the flag fly on a flagpole or mounted to a wall? If on a flagpole, is it the type of flagpole that sits in a bracket to the side of their house? Is it an in-ground flagpole? How tall is the flagpole? It is important that our customers fly the correct size flag. First, because flagpoles are engineered to withstand certain loads (flag sizes) but also, an over sized or undersized flag flying on a pole looks bad. 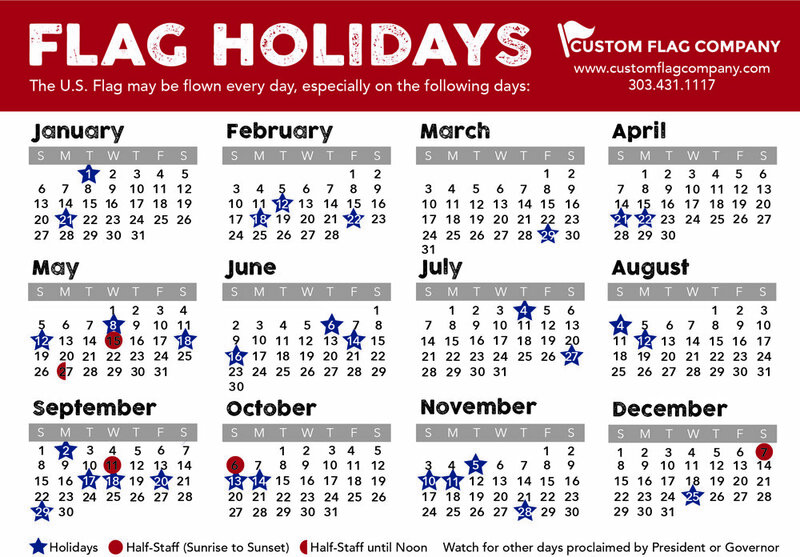 If you are unsure of the size of flag you need, we are always here to assist you, please feel free to give us a call at 303-431-1117, or check out this handy flag sizing chart. Posted on February 8, 2019 by Maddi Griebling.